CARNIVAL CHALKWARE HORSE GRAND PRIZE IN EXCELLENT CONDITION! You are viewing an Outstanding "Carnival Chalkware Horse" in Great Condition! This particular horse is in remarkable condition for chalkware and has only the normal wear and tear from being shelved all these years. The "Big Prizes" that were given away at Carnivals are highly sought after and this particular one is a great find being one of probably a matching set to be used as a bookends prize! They were named "Grande Prize" items at the Carnival. There are a few places that are chipped away but not major for this piece. The ear that appears very white in the photos is not chipped, but is that color naturally. Please see photos which accurately show the condition of the horse. 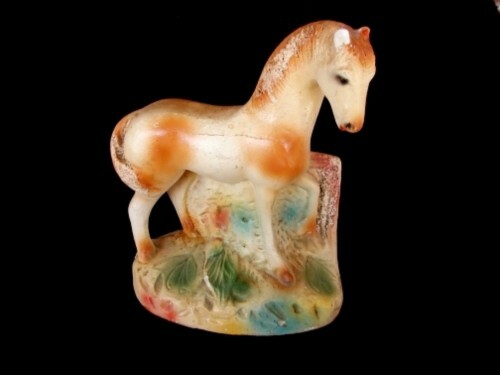 The horse is 10 ½" tall, is 8½" front to back and is 20" all around the base. This was a BIG PRIZE in the Carnival World. Any wear and tear are shown in the photos. This is going to be one of the more prime pieces in Carnival Chalkware and we are have this at a wonderful price having purchased a collection. I have several here so please see our other Chalkware for descriptions and selection. Please see the photo showing the size as compared to an average ink pen. This is a great find for the Carnival Chalkware Collector! If there are any questions or needs concerning this great piece, please feel free to ask on our online support center or through email. We answer all of our mail and correspondence immediately upon receiving. Thank you for Visiting! !